We men are a funny breed, somehow we can’t be bothered to get a nagging injury checked out by a doctor, rationalizing in odd ways like the time it takes to go to the hospital isn’t worth it. Or the doctor probably can’t do much anyway. Sound familiar? 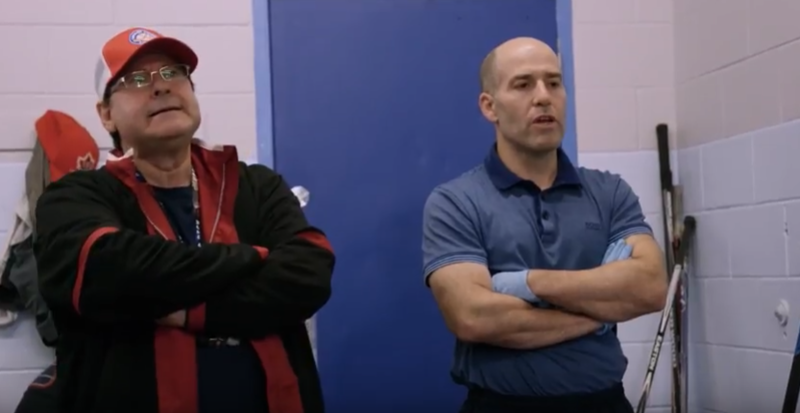 When a hockey player leaves the game with an injury, and you see him disappear into the tunnel, you know there’s a team of health professionals ready to diagnose the problem and put a plan in place. The difference is when you get hurt in beer league – you have to take your health into your own hands, because no one will do it for you. You have to look after injuries even if you think they are just small, because it’s the small ones that can develop into something bigger and keep you off the ice longer. If there are clear signs that something is wrong, you have to get it checked out. If you don’t take care of the first injury, you’re going to get a second injury, which will lead to a third injury and continue to snowball. You need to nip it in the bud. “It’s not that you’re injury prone, what happens is that our body compensates for injuries and uses the healthy parts. Eventually those healthy parts also get strained which can lead you to further injury,” says Dr. Ira Smith, who serves as the current medical director for Toronto FC. For example, if your knee is swollen, and you can’t straighten it out or bend it all the way, or it feels unstable, you have to go see a sports medicine professional, otherwise it’s going to weaken your leg and you’ll be a major liability on the ice. Dr. Smith’s general rule of thumb is if you have an injury that lasts more than two weeks – you need to get it evaluated. And in the meantime, pick another activity that doesn’t hurt. If you can’t skate, you run. If you can’t run, you swim. That way you’re making sure that the healthy parts of your body are ready to go when your injury is better. Conventional wisdom might make it seem like you should stretch out your groin while it hurts – but that’s only going to make it worse. “If you feel a muscle go, it’s usually more than a cramp or a slight strain. You don’t want to stretch it out for a good 2-3 days because you’re pulling on the injury,” says Dr. Smith. You can usually tell a muscle injury within a day or two. So if you wake up, and you can’t walk without a big limp, you’re looking at a serious injury that needs to be evaluated. On the other hand if you can move around when you get up and you don’t really notice it – you’re probably going to be okay. Playing through the pain doesn’t make you a tough guy, and knowing when to seek medical advice doesn’t mean that you’re weak. Professional athletes listen to their bodies and know when it’s time to rest – and so should you. Let’s check in with the Locker Room Doctor and what he has to say on the matter.